Managed identities for Azure resources is a feature of Azure Active Directory. Each of the Azure services that support managed identities for Azure resources are subject to their own timeline. Make sure you review the availability status of managed identities for your resource and known issues before you begin. 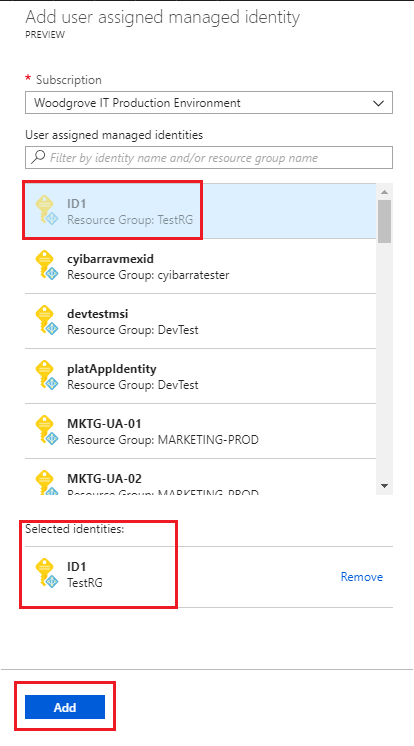 Managed identities for Azure resources provides Azure services with an automatically managed identity in Azure Active Directory. You can use this identity to authenticate to any service that supports Azure AD authentication, without having credentials in your code. In this article, you learn how to enable and disable system and user-assigned managed identities for an Azure Virtual Machine (VM), using the Azure portal. If you're unfamiliar with managed identities for Azure resources, check out the overview section. If you don't already have an Azure account, sign up for a free account before continuing. 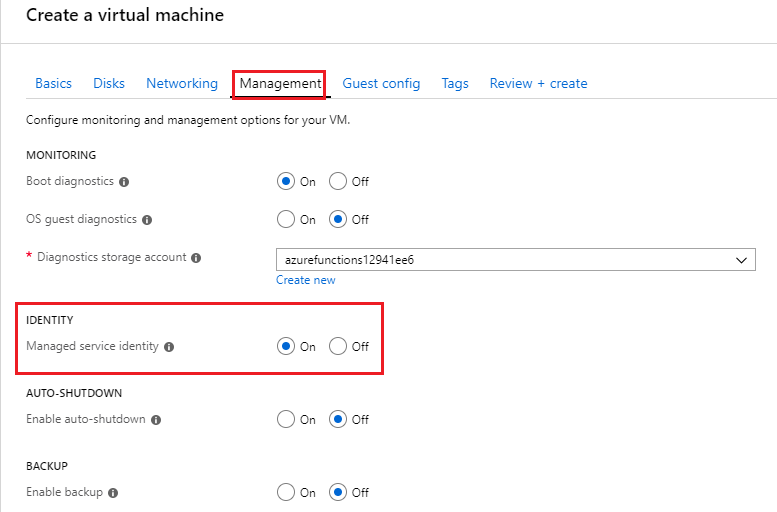 In this section, you learn how to enable and disable the system-assigned managed identity for VM using the Azure portal. To enable system-assigned managed identity on a VM during its creation, your account needs the Virtual Machine Contributor role assignment. No additional Azure AD directory role assignments are required. Under the Management tab in the Identity section, switch Managed service identity to On. To enable system-assigned managed identity on a VM that was originally provisioned without it, your account needs the Virtual Machine Contributor role assignment. No additional Azure AD directory role assignments are required. Sign in to the Azure portal using an account associated with the Azure subscription that contains the VM. Navigate to the desired Virtual Machine and select Identity. To remove system-assigned managed identity from a VM, your account needs the Virtual Machine Contributor role assignment. No additional Azure AD directory role assignments are required. In this section, you learn how to add and remove a user-assigned managed identity from a VM using the Azure portal. To assign a user-assigned identity to a VM, your account needs the Virtual Machine Contributor and Managed Identity Operator role assignments. No additional Azure AD directory role assignments are required. Navigate to the desired VM and click Identity, User assigned and then +Add. Click the user-assigned identity you want to add to the VM and then click Add. To remove a user-assigned identity from a VM, your account needs the Virtual Machine Contributor role assignment. No additional Azure AD directory role assignments are required. Navigate to the desired VM and click Identity, User assigned, the name of the user-assigned managed identity you want to delete and then click Remove (click Yes in the confirmation pane). Using the Azure portal, give an Azure VM's managed identity access to another Azure resource.